Aidy Bryan (center) plays Annie in Shrill. Many of her clothes were made from scratch by costume designer Amanda Needham. 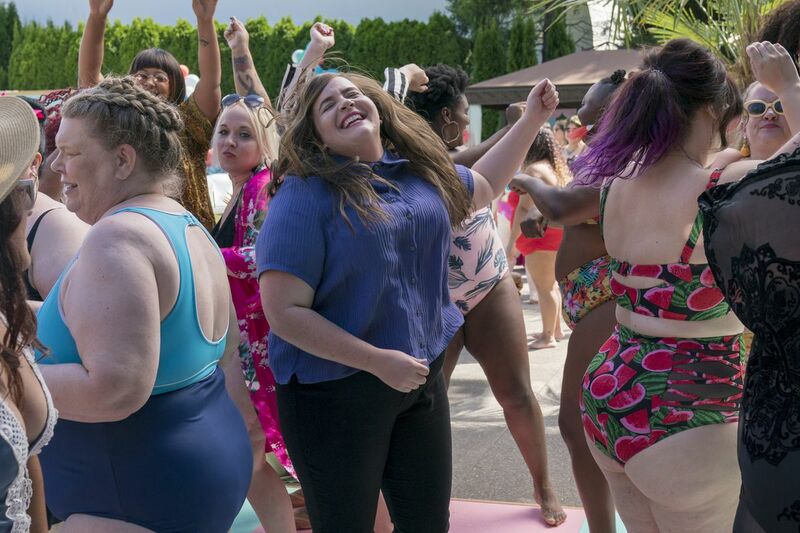 The show captures Annie at a turning point in her life, as she consciously chooses to break free of the fat-girl tropes imposed on her and come into her own as a woman — a fat woman. The first season follows her as she pushes forward in her career (despite a difficult, anti-fat boss), tries to build an adult relationship with her juvenile boyfriend, and confronts the relentless and ridiculous biases that plus-size people face. In many ways, the show is about challenging those biases and depicting women like Annie as people with real, normal lives. First off, congratulations. There’s been such a huge response to Shrill, and to the style in particular. My gosh, it’s been wild! I’m loving it, though. I’ve been getting all these people reaching out to me separately, just to say “Thank you for seeing me.” It makes me want to cry. I bet! Obviously, this show is a first in many ways, but as a plus woman myself, I’d never had the experience of watching a series and really taking note of the clothing and thinking, “Ooh, where can I get that dress?” It was a very pleasant surprise. I think a lot of people feel that way. We never see women of size in fashiony pieces. I couldn’t even find anything for inspiration. You can’t find any examples of looks on people over, like, a size 8 — and even a size 8 is really a faux pas. Before this show, I really believed in the fashion industry more. In the beginning, I think maybe I had a little ego about it. Aidy knew going in that this was going to be a struggle, and I was like, “Oh, there’s stuff for you out there, don’t worry! I’m about to show you the world, and it’s going to be amazing.” Then we ordered all this stuff and when it came in, it was terrible — all polyblend and so cheap. I was like, where are they even buying this fabric? It was borderline insulting. And the sad truth is there was nothing out there. It was a dead zone. So how did you make do? How do you create a distinct personal style for a character when the options are so limited? We just had to go back to the drawing board and make this world ourselves. It was absolutely a collaboration. Aidy has such incredible fashion sense, so I took a lot of cues from her everyday look and then added some moments where it felt more elevated in terms of colors and cuts, just to highlight and celebrate her body. You literally had to make some of the pieces yourself, correct? Yes, most of them actually. There are a couple off-the-rack items. She wears a Rachel Antonoff dress in the first episode, and a Mara Hoffman swimsuit at the pool party, but almost all the other pieces are custom. All the dresses.